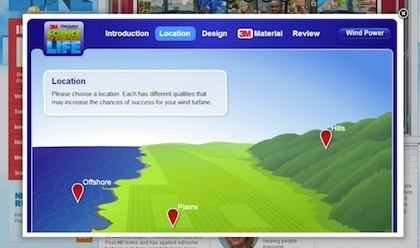 A new free virtual lab teaches students in grades 9-12 how turbines work to generate wind energy. Introduced by Discovery Education and 3M on a joint site, Science of Everyday Life, the inquiry-based learning lab challenges users to create a turbine that will supply 400 homes with electricity for a year at the highest efficiency and lowest cost. A 22-page teacher guide explains that a virtual lab allows students to tackle "real-life problems" in a "virtual environment." This lesson, which can be done in three or four class periods, provides students with experience in engineering design and redesign, testing, research and data collection. The experimentation requires them to examine how location and blade design affect turbine efficiency. The Science of Everyday Life site asks students to examine how location and blade design affect turbine efficiency. Other lessons for the same grades cover the impact of population growth and energy demands and food safety. The same site includes science activities for students in grades K-2, 3-5 and 6-8.